Friday, 30th November 2018 – our Annual Shop Release is now available! I thought it would be a great opportunity to tell you all about the selection process of this release, as it is a little different than usual. Our first step starts pretty much the same though, Mark will scroll through our stock lists and request samples from a number of casks. 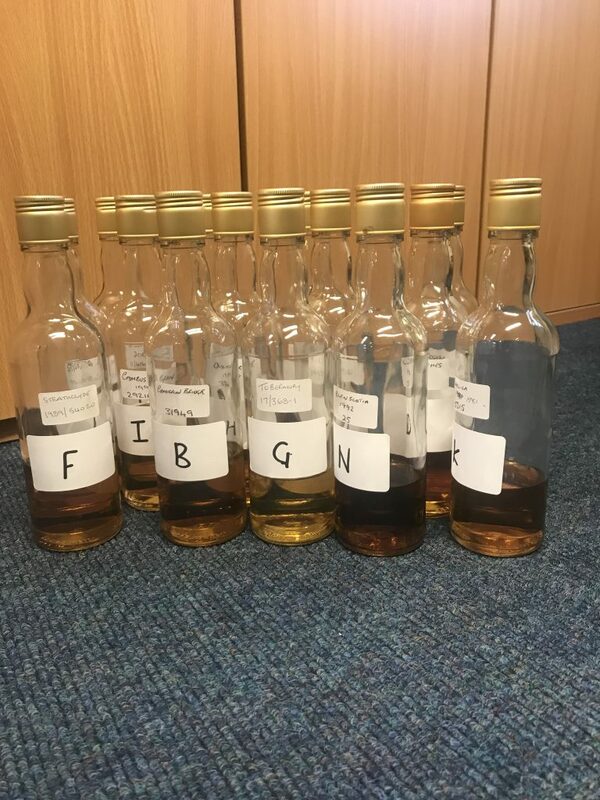 Within a few hours, as our production team are very efficient and very fast at drawing these samples, we hear the clatter of bottles being brought up stairs to Cadenhead HQ. These samples are then tasted while going through a very thorough process – do we like it? Is it good enough to be bottled? Would our customers be happy with this? We were then left with 14 pre-selected samples, each of which we would be happy to bottle. Next, I spent a full day decanting each of the selected samples into 100ml bottles to provide to each of our 9 Cadenhead Whisky Shops. This was a very intense process, I had to ensure that I did not mix up the bottles or the samples to make sure each shop received the same sample. Anyone that knows me well will know that I am very easily distracted! To prevent me from messing this up I started with labelling each of the original sample bottles that included the product details with an allocated letter (A-N). I also typed the bottling details and the allocated letter onto a spreadsheet. The responsibility of selection is then passed onto each of our Cadenhead Shops. As the shops were still unaware of our plans of this “Shop Release” I provided them with this information and to expect 14 samples with no other details than a letter on the bottle. Each shop were asked to taste each of the samples and provide us with their top 4 choices that we would bottle and label appropriately for each shop. We also agreed if more than one shop preferred the same sample the oldest shop would be given their favourite and the younger shop would be allocated their second choice. 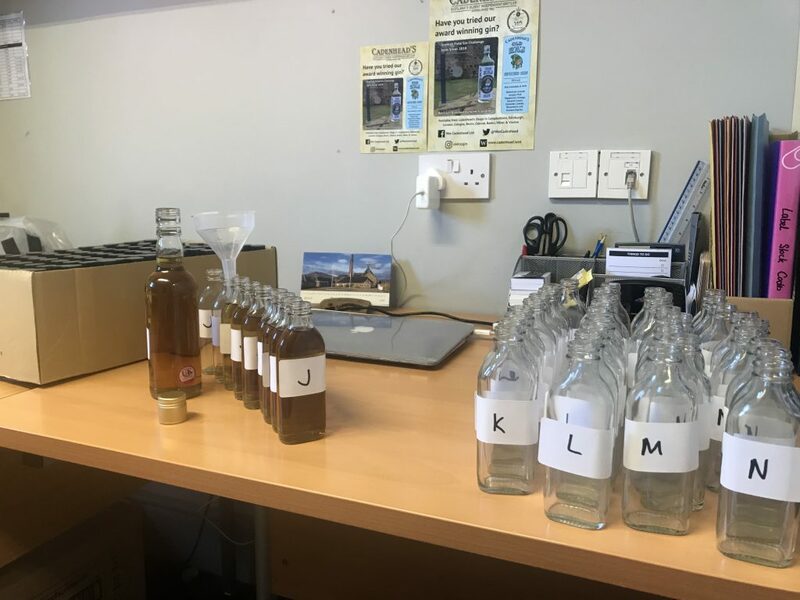 The team in the Campbeltown shop tasted 4 samples at a time over a few days, each taking their own notes, and choosing their favourite from the batches. The guys in our London shop chose a different route, they invited 12 lucky club members to a tasting night. Providing their guests with the samples the group of 12 chose their preferred options. Kiss & Angus in our Odense shop tasted the samples with a few friends, they had fun trying to guess a few – is this a grain, maybe it’s a rum? Our friends in Cologne each tasted the samples and marked them out of 5, adding the marks up and taking the average they were left with their top 4 choices! I contacted a few shops to ask how they were getting on tasting the samples. I was also asked on more than one occasion if there was Rum and Cognac in the mix or if it was all Whisky. Of course, I did not provide them with any information. I was confident that Mark would have forgotten what was on the list, Cameron was on his travels and I also hid all the left over samples so no-one would be able to find out the information. All questions asked proved our shops were getting close to the truth, we had a mixture of samples – Whisky, Rum, Grain and Cognac! The results came in everything was looking good. So far everyone was due to get their first choice and we were only waiting on results from Baden, Switzerland. Of course it couldn’t go that smoothly! Baden had the same first choice as Vienna! As Vienna is our newest shop Baden received their first choice and Vienna moving onto their second choice. All parties were pleased with the results and this was now looking like a very tasty release! It was then left to Mark to choose a cask to represent the Shop in Aberdeen, where it all started. Now the bottling details had been confirmed it was “all systems go” to get the information passed on for labels, tasting notes and slotted into our extremely busy bottling hall programme! Each Cadenhead Shop now had a cask they had tasted and enjoyed bottled and labelled appropriately with their shop front on the label. 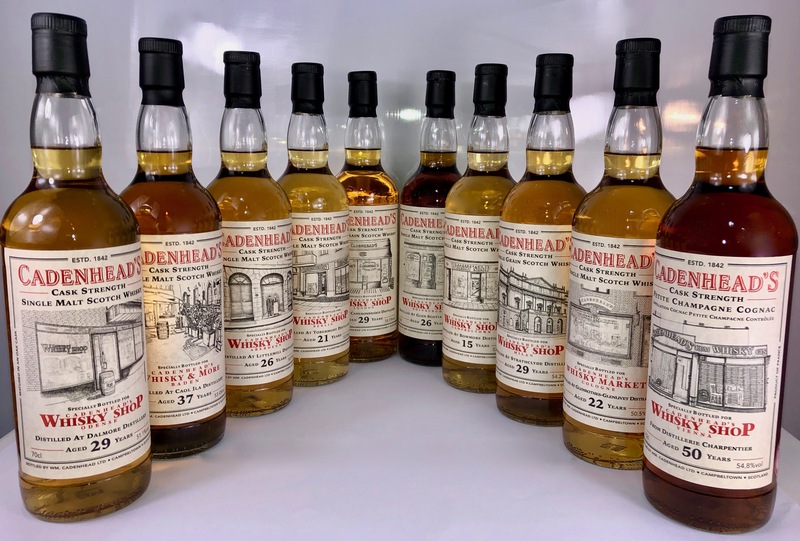 As all Cadenhead Shops are provided with a minimum of 1 case of everything that Cadenhead’s bottle, they would each receive an allocation of every other shop choice then receive the remains of their own cask choice. After listening to feedback from our customers last year we decided to allocate a little differently. Each shop were provided with a minimum or 2 cases from another shops bottling, depending on the size on the final outturn we were then able to provide a case or 2 more from other shop choices. Orders were shipped to all Cadenhead Shops and these bottles are now available to buy from today! Looks like the choices might outshine last shop bottlings.